On that fateful Feb. 8, the Tar Heels lost. To Duke. I’m still in shock. Horrible, dumbfounded, disbelieving shock. I was in the risers, and the risers were struck like a cresting wave sneezed on by the Ice Queen. But life must return to normal, and although it might seem odd to find ‘normality ’ in Carrboro, the CW bus was a much livelier affair. Like the wheels of a bus, life keeps turning. In fact, I discovered that even the most mundane tasks must be attended to: laundry must be done. After cruising down the newly reopened Weaver Street, the bus pulled to a stop just past the Century Center. A few got on, a few got off, the bus moved out – for about two seconds. The bus came to a sudden, lurching stop as a man with purple headband ear warmers that had fallen over his eyes and about four bags draped and strapped across him ran for the bus. The bus driver pulled back her window, “You need to get on?” she says. I didn’t catch his reply, but the doors swung open again, and the loaded down man clambered on. 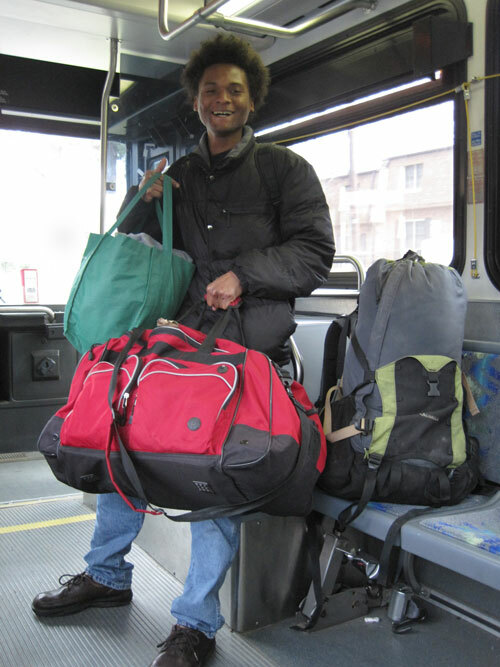 He proceeded to rearrange his bags: one in the small luggage-top, two in the seat beside him, and one hitchhiker backpack on the floor at his legs. Either this man was about to mastermind the bus connections and make it all the way to Alaska, or he was frugally moving homes. Neither was the case. “It’s all my laundry,” he explains. Eric Baldwin, a 24-year-old who lives on West Main Street in Carrboro, has lived in this town his whole life. He tells me he knows his way around, and this is further affirmed when he tells me that the launderette he previously went to on Martin Luther King Boulevard charges $7 per load, and although it has larger machines than the one he now goes to on Jones Ferry Road, the latter charges just $3 per load, and he can really stuff the machine. While he finds the price at Jones Ferry Road agreeable, there is still the small issue of carting his load there and back. Ah, the easy life of those with personal vehicle transportation. Easy though it may be, they certainly miss out on an incomparable kind of social experience. As he speaks, it emerges that there’s another reason why Eric chooses not to drive. I’m thinking, this is 2012? Never mind the date, this is Carrboro, the liberal bubble of North Carolina? There are other things that are keeping him busy, he says. The CW bus route actually makes a brief pass near my university when it circles Columbia Street. As we skirt Chapel Hill, he asks me if I too am student. I tell him I am. “Tough loss the other night,” he sympathizes. Or so I think. Eric’s men have moved on, he says he was a fan in the days of Ty Lawson, Wayne Ellington, back when Tyler Zeller was a freshman, and years before that. “I’ve been ridin’ with Hansbrough since he was a freshman. Carolina was my favorite team at the time,” he admits. But now that his group has moved on, he says that things have changed. This is a considerable change from the remarks I heard a few bus rides ago. It’s another perspective and another story. But even though I differ with Eric in our allegiance to Carolina, I meet him on another point. I really need to do some laundry. For a printer-friendly version of this post click here .